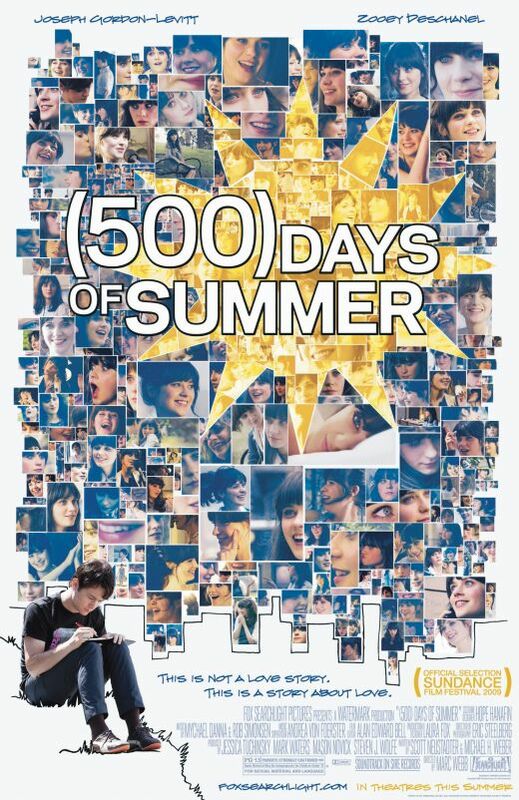 500 Days of Summer jumps between the 500 day span of the two leading characters, Tom (Joseph Gordon-Levitt) and Summer (Zoey Deschanel). Tom Hansen meets Summer Finn at work when she is introduced as his boss’s assistant. Tom, although qualified as an architect, works for a greeting card company. After a karaoke night, McKenzie (Geoffrey Arend), Tom’s drunk co-worker and supposed to be friend tells Summer that Tom likes her. Even though she makes it clear she doesn’t believe in labelling relationships and don’t want anything serious, Tom, who is very serious about relationships, starts dating her. Tom and Summer eventually break up. Summer leaves the company and Tom deteriorates. Later Tom attends a colleagues wedding and Summer is also there. They dance together and she falls asleep on Tom’s shoulder on their way back. She invites him to a party she’s having and he decides to attend. What he thinks will happen at the party and what actually does is vastly different. Instead of reconciliation, Tom sees Summer’s engagement ring. Tom is deeply depressed again. After a few days of only leaving the apartment to get more alcohol and food, Tom arrives at work and quits. He becomes dedicated to being an architect again and starts going on interviews. Tom finds Summer at his favorite spot and he questions her decisions. She tells him that she found out that she believes in love and relationships but that he wasn’t the right man for her. She tells him she is happy he is doing well and he tells her that he really hopes she stays happy. A few days later, Tom meets a beautiful woman applying for the same position as he. They start talking and it is obvious that they share common interests. Tom asks her on a coffee date and she agrees, and she tells him her name is Autumn. The movie ends with an animation of number one, showing that a new relationship is starting. The movie was progressing fine, a bit depressing, but well shot and original. Then they named his next girl Autumn and started it at day one and I was like you have got to be shitting me. Hasn’t this poor man had enough trouble with SEASONS? No, let’s just give him more grief. I understand that I am perhaps the only person on the planet that didn’t like the movie. It grossed 27 times its original budget, so it is obviously popular stuff. I classified it in the wrong genre – I thought perhaps it might be a romantic comedy or a romantic movie but alas now, it is a comedy-drama (dramedy?). So I went in expecting something and got something entirely different, so my utter confusion is perhaps understandable. Also, I watched Sleeping Beauty before it so the difference is VAST and WIDE. Mark Waters produced * it. I did not know this little fact before the movie, but now it is all clear. He also directed the massive failure of a movie of one of my favorite series, Vampire Academy. PS: He also directed Mean Girls and Friday. Mean Girls is probably his best work because Freaky Friday was INCREDIBLY freaky. It is utterly depressing. I might have had more of a positive feeling at the end if they didn’t put that (1) in where Autumn enters. Cue massive disappointment. I really like Joseph Gordon-Levitt and have always felt that he is under appreciated in Hollywood. I mean, the guy is awesome. I truly felt sorry for him as Tom because he was really into Summer. I thought Summer was a selfish girl but honest about it, so it wasn’t really appropriate to dislike her. Chloë Grace Moretz also finally had a role where I didn’t want to slap her as Tom’s sister.